Corrosion-resistant and ideal for refrigeration areas or pharmaceutical applications. Material: PVC, excellent resistance to impacts, moisture and chemicals, ensuring long life. Working temperature range of –40°C to +80°C. Smooth surfaces to allow easy cleaning. Rounded profiles to prevent damage to packaging. Easy to assemble without tools. 1000mm wide bays: 2 uprights (6 connections), 3 middle shelves, 1 top shelf. 1500/2000mm wide bays: 3 uprights (9 connections), 3 middle shelves, 1 top shelf. Highly versatile shelving, perfect for hygiene-sensitive areas. 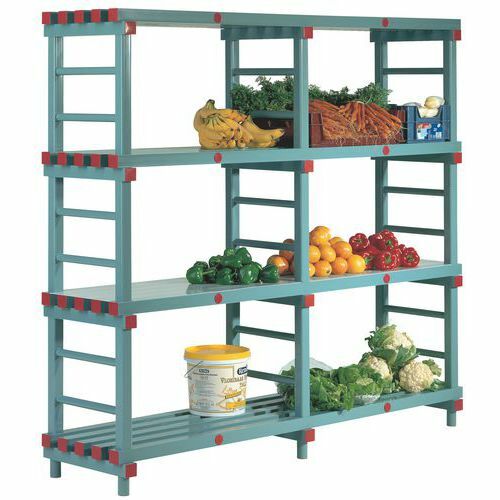 A highly versatile storage system with individual bays allowing you to create virtually any layout of static shelving.